New Jersey, New York, and California are the leaders in a new ranking of states that have successfully reduced their prison population. Rebecca McCray is a TakePart staff writer covering criminal justice and legal issues. She is based in New York. For years now, American prisons have seen remarkable growth that has made the U.S. the global leader in incarceration rate, with 2.2 million people in prison. The massive growth has left officials scrambling to find ways to pack more prisoners into overcrowded existing facilities, while others are experimenting with policy tweaks to save money and reduce prison populations. Now, a new analysis has ranked the states that are succeeding in doing that. New Jersey, New York, and California took the lead in a ranking of the 34 states that reduced their populations between 1999 and 2013. The new analysis, released by criminal justice reform group The Sentencing Project, shows that as states embark on a variety of policy and practice shifts and experiments, some are seeing real—if modest—results. The decrease in prison populations occurred alongside a steady decline in crime over the last two decades, demonstrating that states are able to simultaneously cut their prison population without impacting public safety, reform advocates say. The violent crime rate fell by more than 25 percent in each of these three states between 2006 and 2012, while fewer people were being put in prison. While it would be nice if we could point to one state’s magic formula for success, it’s not that simple. Instead, a complex variety of economic, social, and environmental factors played intothe crime drop nationwide, according to a February study conducted by the Brennan Center for Justice, a nonpartisan law and policy institute. The study found that CompStat-style computer programs, which police departments use to collect crime data, have contributed to the decrease by helping the departments identify crime patterns and better focus their resources. But putting people in prison? Not so much. Less than 1 percent of the property crime decrease could be attributed to incarceration—and locking people up had a negligible impact on violent crime, according to the Brennan Center. After a lawsuit targeted the state’s parole board in 2001 for its lengthy backlog of parole hearings and failure to meet deadlines, parole approval rates in the state rose from 30 percent to 51 percent and have continued to rise, which means more people are being released. The introduction of drug courts has also meant that more nonviolent drug offenders are being diverted away from prisons and jails and put into alternative programs. In 2002, 1,600 drug offenders were spared from incarceration because of these programs. Drug policy reform has also played a key role in reducing the state’s incarceration rate. After reviewing its strict “drug free zone” law, the state decided to exempt low-level offenders from prosecution under the law and passed a bill to loosen mandatory minimum sentences for drug offenders. These reforms reduced New Jersey’s state and federal prison population by 28.7 percent. As of 2013, there were 28,595 inmates in New Jersey’s state and federal prisons. New York’s Rockefeller Drug Laws, enacted in 1973, fell under close scrutiny after the prison population swelled thanks to the introduction of severe mandatory penalties for drug offenders. In 2009, then Gov. David Paterson signed a reform bill that eliminated mandatory minimum sentences in most drug cases, offered diversion to treatment programs and alternatives to prison, and permitted some people who were sentenced under the Rockefeller laws to be resentenced. The state also reduced prison admissions by shortening probation terms for low-risk offenders. These reforms reduced New York’s state and federal prison population by 26.7 percent. In 2013, there were 58,024 people in New York’s state and federal prisons. The dramatic drop in California’s prison population between 2010 and 2012 was driven by a 2011 Supreme Court order requiring the state to cut its prison population by 37,000 prisoners. That order resulted in a “realignment” policy, which involved the transfer of thousands of state prisoners to county jails, and the release of some offenders on probation. While county jail populations have increased as a result, The Sentencing Project said the net effect still resulted in a reduction of the incarcerated population. 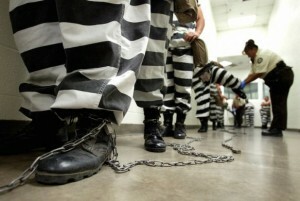 Since their peak in 2006, California’s state and federal prison populations have shrunk by 21.8 percent. As of 2013, there were still 152,155 people in California’s state and federal prisons.